Opening this fall on October 7, The Phillips Collection presents an exceptional exhibition inspired by the museum’s celebrated Luncheon of the Boating Party (1880–81) by Pierre Auguste Renoir. 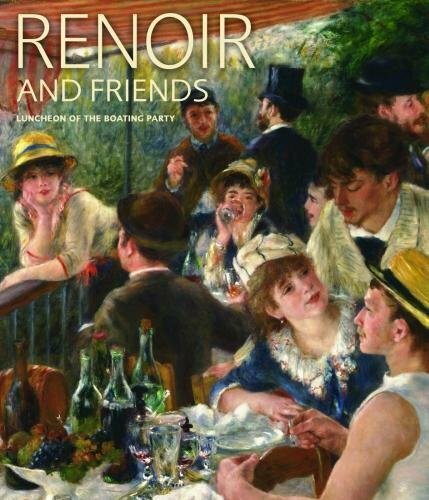 Comprised of more than 40 carefully chosen works from private and public collections around the world, Renoir and Friends: Luncheon of the Boating Party explores the process by which the artist created his masterwork, while also recounting and illustrating stories of the diverse circle of friends who inspired it. Dance at the Moulin de la Galette (1876) comprises as many figures as Luncheon of the Boating Party. While never intended as a group portrait, the 14 individuals depicted in the painting appear nonetheless highly individualized and based on specific people in Renoir’s life. A room in the exhibition dedicated to research on the masterwork will feature an in-gallery interactive that uses findings from x-radiographic and infrared images and paint cross-sections. While never intended as a group portrait, the individuals depic ted in the painting appear nonetheless highly individualized and based on specific people in Renoir’s life. 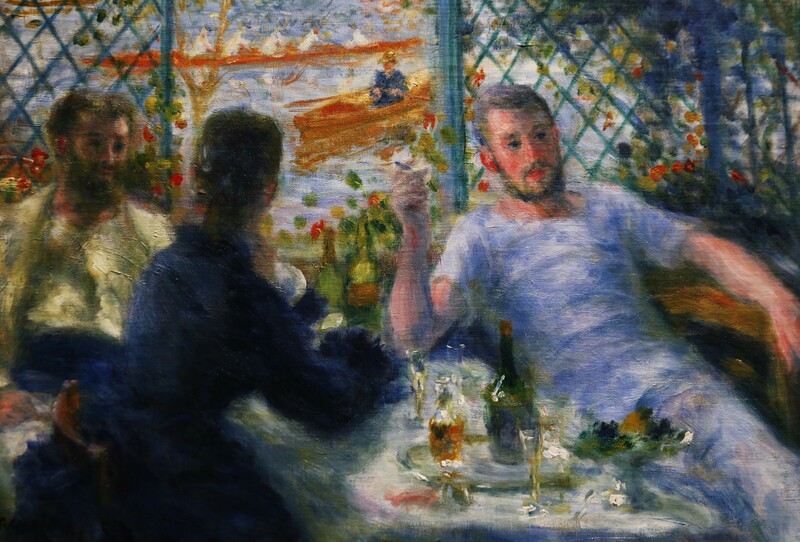 Figures seen in Luncheon of the Boating Party who were especially influential during Renoir’s career include his wife and frequent muse Aline Charigot, artist and boating enthusiast Gustave Caillebotte, and art critic and collector Charles Ephrussi. as well as loans from the Rhode Island School of Design Museum; Museum of Fine Arts, Boston; Philadelphia Museum of Art; among others. 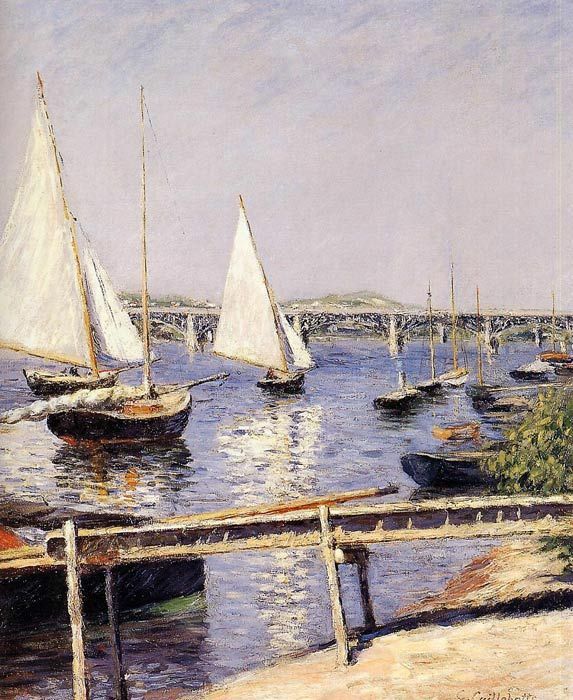 A rich spectrum of works by Renoir’s close friend Gustave Caillebotte will also be on v iew. and rarely seen loan s from private collections. The stories of Renoir’s models will also be told through photographs, prints, drawings, and even a small selection of hats, on loan from the Museum of the City of New York, similar to those worn by the individuals depicted. Just as Phillips imagined it would be when he bought the painting in 1923, Luncheon of the Boating Party by Renoir remains the best known and most popular work of art at The Phillips Collection. The painting captures an idyllic atmosphere of friends sharing food, wine, and conversation on a balcony overlooking the Seine at the Maison Fournaise restaurant in Chatou. Parisians flocked to the Maison Fournaise to rent rowing skiffs, eat a good meal, or stay the night. The painting also reflects the changing character of French society in the mid‐to late 19th century. The restaurant welcomed customers of many classes, including businessmen, society women, artists, actresses, writers, critics, seamstresses, and shop girls. This diverse group embodied a new, modern Parisian society. 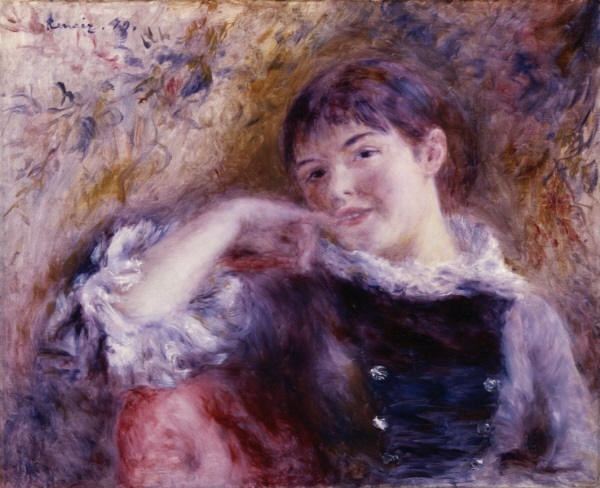 Among those who appear in Renoir’s work numerous times in the late 18 70s and early 1880s were three actresses—Ellen Andrée, Angèle (who also made a living as a florist), and Jeanne Samary—as well as Alphonsine Fournaise, daughter of the owner of the Maison Fourn aise, whom he often saw at her father’s establishment in Chatou. In his desire to paint scenes from contemporary life, Renoir preferred to depict individuals in their familiar surroundings. 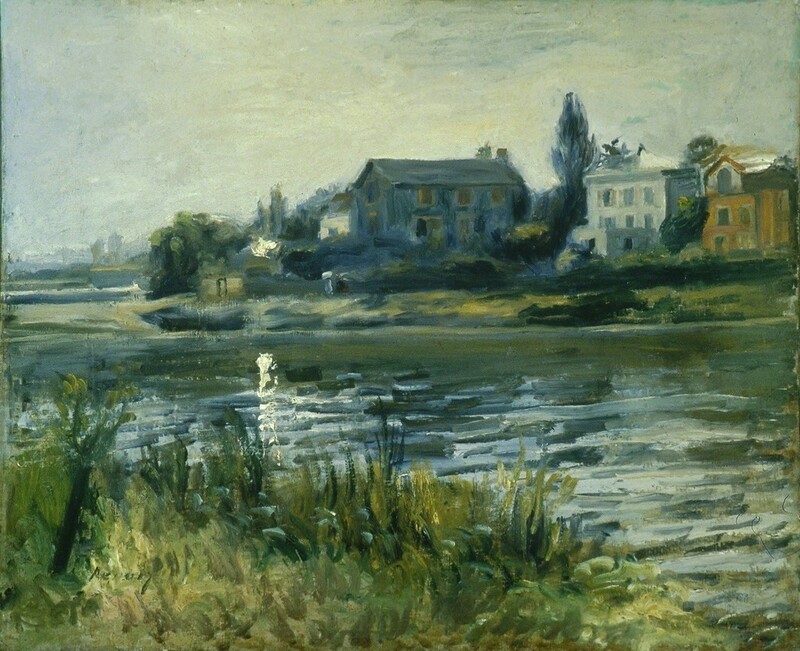 Aline Charigot spent her childhood in the village of Essoyes, but came to Paris to join her mother in 1874, and lived not far from Renoir ’s studio on rue Saint Georges. 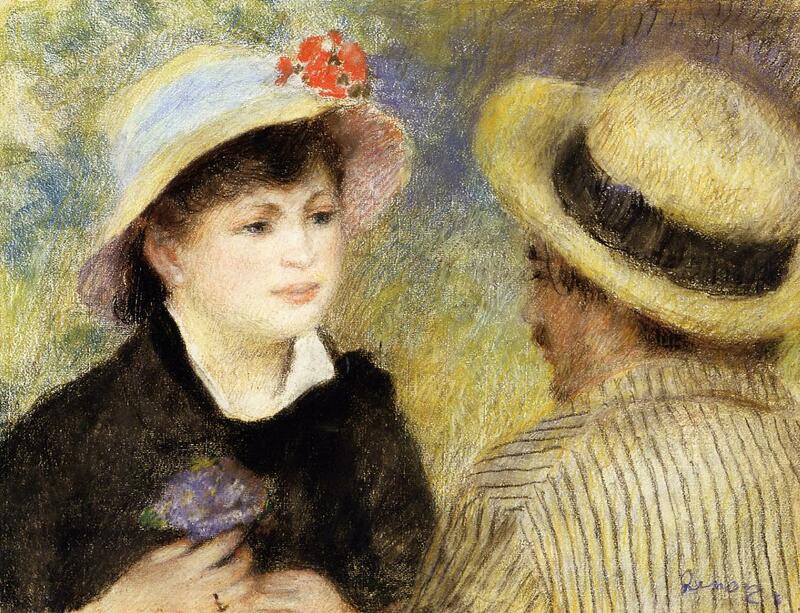 She probably met Renoir in 1879, when she was 20 years old. She was younger than Renoir by 18 years, entering his life as he was beginning to receive the recog nition and commissions necessary to stabilize his ca eer. In 1885 they had their first child, and in 1890 they were married. They had three sons: Pierre, Jean, and Claude. According to Jean’s descriptions of his mother, she was the ideal partner for his father: a generous companion who never lost her love of the countryside, and when they acquired their property in Cagnes, was ready to roll up her sleeves and work the land. She served as a regular model for her husband, and, according to Jean, all his father’s paintings of women after he met Charigot resemble her to some degree. PIERRE‐AUGUSTE RENOIR (1841–1919) The Seine at Chatou (La Seine à Chatou) 1874 Oil on canvas Dallas Museum of Art, The Wendy and Emery Reves Collection During the 1870s, Renoir often vis ited Chatou, the site of the Maison Fournaise, where he painted Luncheon of the Boating Party . 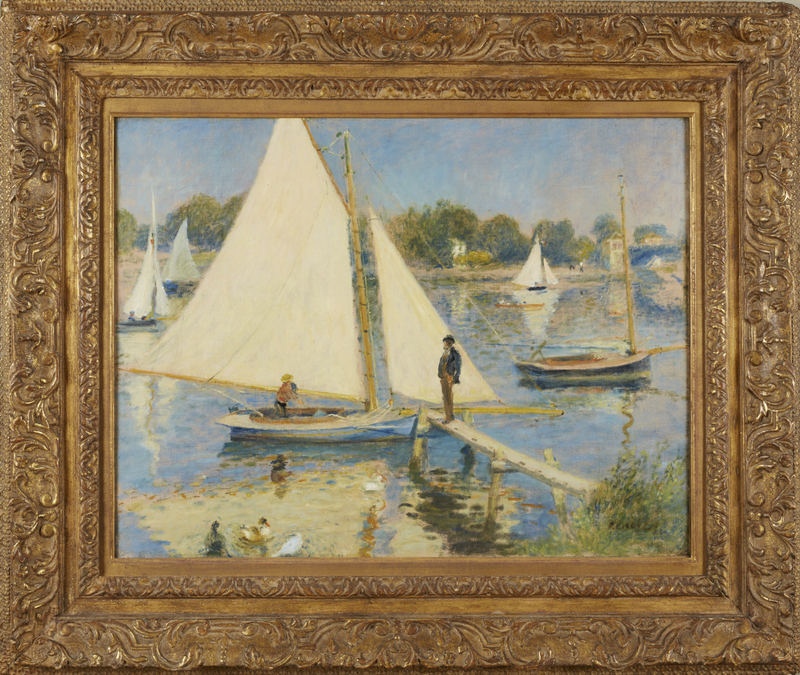 In his lively rendering of a gusty day on the water, Renoir i ncludes a sailboat, signaling in his paintin g the growing popularity of t he sport. The Phillips Collection thanks Alan Inouye for his support in b ringing this work to Washington. Success came slowly to Renoir. The Franco‐Prussian War of 1870– 71 caused economic depression in France. Impressionism was controversial and not well received by tradition‐bound critics and institutions. But the establishment of the Third Republic broug ht a tide of optimism and prosperity that lifted Renoir’s fortunes toward the end of the decade. Keenly a ware of the value of personal contacts and social connections, the artist cultivated the support of wr iters who understood and praised his work and collectors who purchased, and soon, in greater numbers, com missioned portraits and decorations. Among those who helped him weather the challenging years of the 1870s were the very individuals who modeled in 1880 for Luncheon of the Boating Party. A diverse group of men and women—many of them well‐traveled and worldly, many of them stars of their chosen fields, and some of them in positions of significant influence in the art world—these friends offered Renoir essential support and encouragement. Museum founder Duncan Phillips purchased Luncheon of the Boating Party from the Durand‐Ruel Gallery for the reco rd sum of $125,000 in 1923, just two years after he opened his museum to the public. The only painting by Renoir in his collection, Luncheon of the Boating Party has remained the museum’s greatest treasure. Two documents in the archives of the Durand‐Ruel Gallery tell us that Gustave Caillebotte served as a model for Luncheon of the Boating Party , one of which identifies him sp ecifically as the man in the lo wer right corner of the composition. 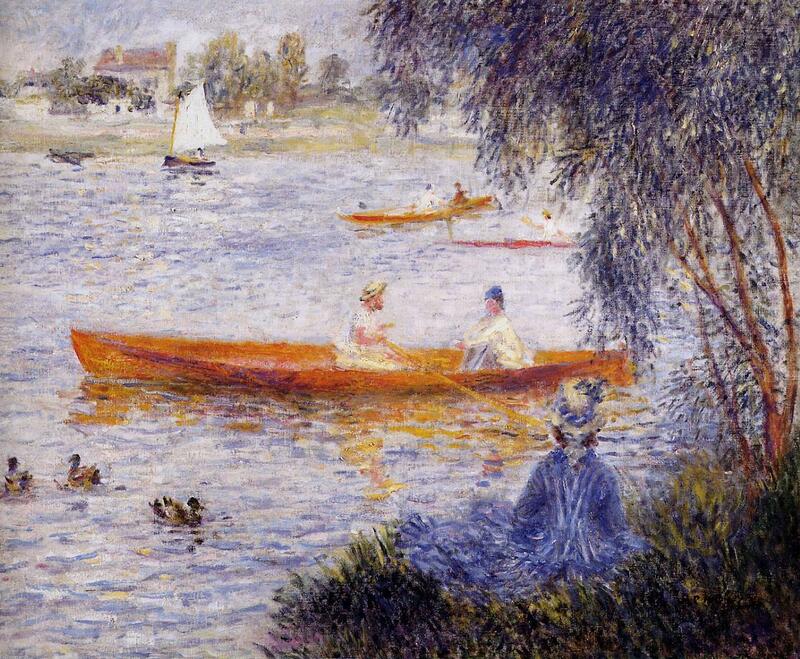 Renoir’s good friend was not o nly a painter but also a designer of boats, an oarsman, and a distinguishe d yachtsman. 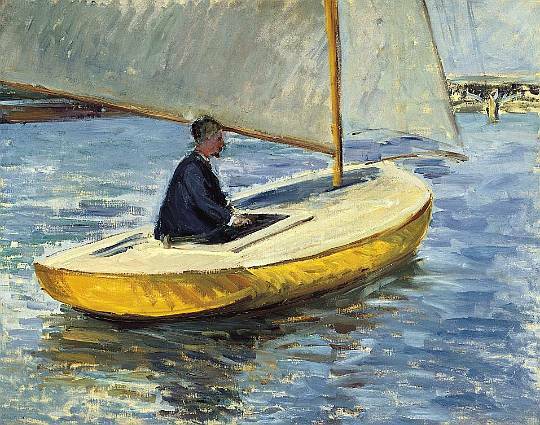 By 1879, Caillebotte owned his own sailboat, participated in regattas in Argentue il, and had joined the Cercle de la Voile de Paris (Sailing Club of Paris); he became a vice president of the club in 1880. 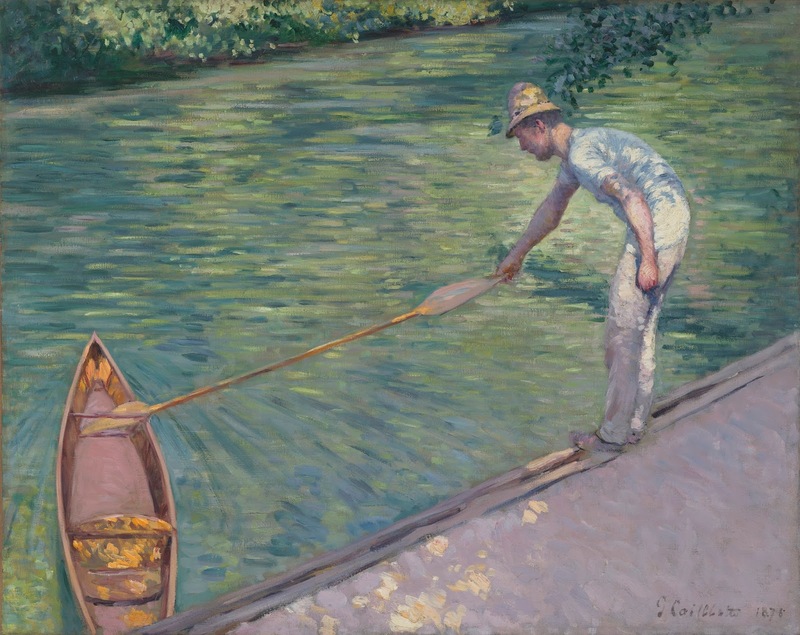 Born into a family that made its money in the textile business, Caillebotte used his considerable means to support his Impressionist colleagues and to purchase their work. 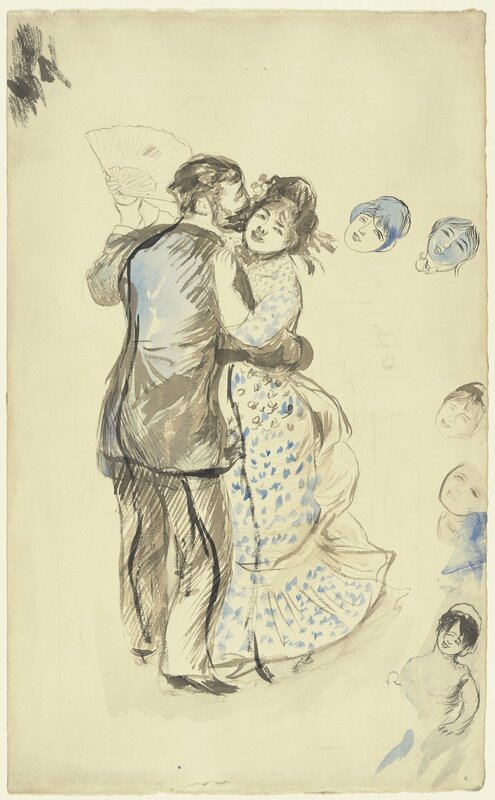 Among his early acquisitions was Renoir’s Dance at the Mou lin de la Galette (1876, Musée d’Orsay), shown at the third I mpressionist exhibition. Caillebotte’s friendship with Renoir was a close one: in 1876, Caillebotte named Renoir executor of his will, and when Renoir and Charigot had their first son in 1885, they asked Caillebotte to be the child’s godfather. PIERRE‐AUGUSTE RENOIR (1841–1919) The Seine at Argenteuil (La Seine à Argenteuil) 1874 Oil on canvas Portland Art Museum, Oregon, Bequest of Winslow B. Ayer Presumed to have been created on an outing with Claude Monet, w ho painted the same view, this landscape offers Renoir’s interpr etation of a sailboat coming into dock on the Seine at Argenteuil, a location renowned for its sailing regattas that provided a lively plein air subject for Renoir, Monet, Manet, and other fellow Impressionists. PIERRE‐AUGUSTE RENOIR (1841–1919) The Seine at Chatou (La Seine à Chatou) c. 1871 Oil on canvas Art Gallery of Ontario, Toronto, Purchased 1935 As early as 1869, Renoir was exploring the banks of the Seine west of Paris, seeking subjects for his developing Impressionist style. His mother lived near Louveciennes, not far from Chatou, where he would frequent the Maison Fournaise with its restaurant, lodging, and boats for hire. PIERRE‐AUGUSTE RENOIR (1841–1919) Boaters of Argenteuil (Canotiers d’Argenteuil) 1873 Oil on canvas Larry Ellison Collection This delightful landscape celebr ates many reasons for leaving the heat, bustle, and filth of Paris for an outing in the country: sailing, rowing, and enjoying river activities from a shady bank. PIERRE‐AUGUSTE RENOIR (1841–1919) The Dreamer (La Rêveuse) 1879 Oil on canvas Saint Louis Art Museum, Museum purchase The model for this painting is thought to be Alphonsine Fournai e, whom Renoir often saw at the Maison Fournaise in the late 1870s. She posed for him regularly during the years leading up to Luncheon of the Boating Party . Although there is no direct evidence that Alphonsine modeled for the young woman leaning on the railing of the balcony in the grand composition, she may have occasionally joined the clientele at the Fournaise in such a way. PIERRE‐AUGUSTE RENOIR (1841–1919) On the Shore of the Seine (Paysage bord du Seine) c. 1879 Oil on linen The Baltimore Museum of Art, Sadie A. May Bequest, Courtesy of the Fireman’s Fund Insurance Company This quickly executed oil study was probably a gift from Renoir to Alphonsine Fournaise to thank her for modeling for him. In 1864 she married Louis Joseph Papillon, an d we know that a Madame Papillon once owned this piece. EDGAR DEGAS (1834–1917) Portrait of Ellen Andrée (Portrait d’Ellen Andrée) c. 1876 Monotype in black and brown ink on ivory paper The Art Institute of Chicago, Potter Palmer Collection Ellen Andrée, born Hélène André around 1855, started acting in 1879. She was a favorite of Degas, Manet, and Renoir, using her talents as an actress to play many roles as a model. In the early 1880s she gave up modeling entirely and in 1887 she joined a naturalist t heater, the Teâtre‐Libre. Her career took her to the United States, Argentina, and Russia. She married He nri Julien Dumont, a painter who specialized in flowers. Degas mad e several portraits of her and she modeled for his painting In a Café (L’Absinthe) . EDGAR DEGAS (1834–1917) The Actress Ellen Andrée (L’actrice Ellen Andrée) 1879 Drypoint Museum of Fine Arts, Boston, Katherine E. Bullard Fund in memo ry of Francis Bullard, by exchange Ellen Andrée is thought to have modeled for Luncheon of the Boating Party as the woman in the center of the composition raising a gla ss to her lips and/or the woman in the lower right corner looking up. PIERRE‐AUGUSTE RENOIR (1841–1919) Bridge at Chatou (Pont à Chatou) c. 1875 Oil on canvas Sterling and Francine Clark Art I nstitute, Williamstown, Massachusetts This bridge crossing the Seine at Chatou is visible from the balcony of the Fournaise restaurant and can be glimpsed in the background of Luncheon of the Boating Party. The Phillips Collection thanks Greg and Bess Ballentine for the ir support in bringing this work to Washington. PIERRE‐AUGUSTE RENOIR (1841–1919) Woman with a Fan (Femme à l’éventail) c. 1879 Oil on canvas Sterling and Francine Clark Art I nstitute, Williamstown, Massachusetts Woman with a Fan probably depicts Jeanne Samary. Her dressing room at the Coméd ie‐Française was decorated with striped wallpaper and had Japanese fans on the ceiling. This is one of at least five images of Samary that Renoir made in t he late 1870s. The artist’s son, Jean, wrote that she modeled for Luncheon of the Boating Party , and she has been identified as the woman in the upper right c orner surrounded by admirers. Jeanne Samary—Smiling Digital print from a 19th‐century original Comédie‐Française Bibliothèque‐musée, Paris Famous for her smile and as a brilliant per former of Molière, J eanne Samary dazzled the audience at the Comédie‐Française, where she d ebuted in 1875. She lived with he r parents near Renoir’s studio until she married a banker in 1880. In 1890 she died of typhoid fever at age 33. PIERRE‐AUGUSTE RENOIR (1841–1919) Boating Couple (Les Canotiers) 1880–81 Pastel on paper Museum of Fine Arts, Boston, Given in memory of Governor Alvan T. Fuller by the Fuller Foundation The young woman in this pastel wears a ring on her third finger and holds a bouquet of violets. She gazes into her partner’s eyes a nd is clearly the object of his affection. This intimate pair is thought to represent Aline Charigot and Renoir himself. During the summer of 1880 the couple spent an increasing amount of time together, not lon g before she took on a starring role in his masterwork, Luncheon of the Boating Party . PIERRE‐AUGUSTE RENOIR (1841–1919) AND RICHARD GUINO (1890–1973) Mother and Child (Mère et enfant) 1916 Bronze The Phillips Collection, Acquired 1940 Based on a painting by Renoir fr om 1885 of Aline Charigot feedi ng their first child, this sculpture is one of several that resulted from a collaboration between the paint er and sculptor Richard Guino. Charigot died in 1915, prompting Renoir to commemorate her in this piece . PIERRE‐AUGUSTE RENOIR (1841–1919) Young Woman Reading an Illustrate d Journal (Jeune femme lisant un journal illustré) c. 1880 Oil on canvas Museum of Art, Rhode Island School of Design, Providence, Rhode Island, Museum Appropriation Fund Page 8—Wall Text: Renoir and Friends Aline Charigot is the young woma n reading a journal in this int imate scene that reflects her interest in fashion, as well as her close r elationship with the artist. PIERRE‐AUGUSTE RENOIR (1841–1919) Young Woman Sewing (Jeune femme cousant) c. 1879 Oil on canvas The Art Institute of Chicago, Mr. and Mrs. Lewis Larned Coburn Memorial Collection Charigot, a seamstress, is probably the subject of Young Woman Sewing . Like the painting of the woman reading, it recalls the art of Fr agonard and Vermeer, demonstra ting the deftness with which Renoir could declare his admiration for these masters while also bring ing his subjects into the present in a scene of intimate domesticity. PIERRE‐AUGUSTE RENOIR (1841–1919) Mademoiselle Charlotte Berthier 1883 Oil on canvas National Gallery of Art, Washington, DC, Gift of Angelika Werth eim Frink Just as Renoir’s friend and fello w artist Gustave Caillebotte p ainted Aline Charigot in the garden of his house at Petit‐Gennevilliers in 1891, so too did Renoir paint C aillebotte’s sweetheart, Charlotte Berthier, though a few years earlier and in a more formal indoor setting. 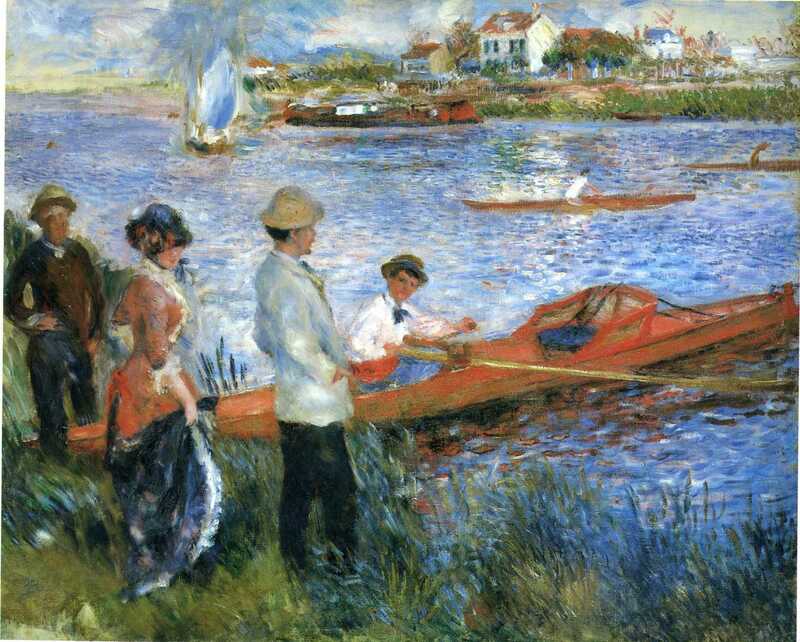 PIERRE‐AUGUSTE RENOIR (1841–1919) Oarsmen at Chatou (Les Canotiers à Chatou) 1879 Oil on canvas National Gallery of Art, Washington, DC, Gift of Sam A. Lewisoh n The two prominent figures on the banks of the river are traditi onally identified as Gustave Caillebotte and Aline Charigot. An oarsman a ppears to extend an invitation to board, though it is unclear which, if either of them, will accept. 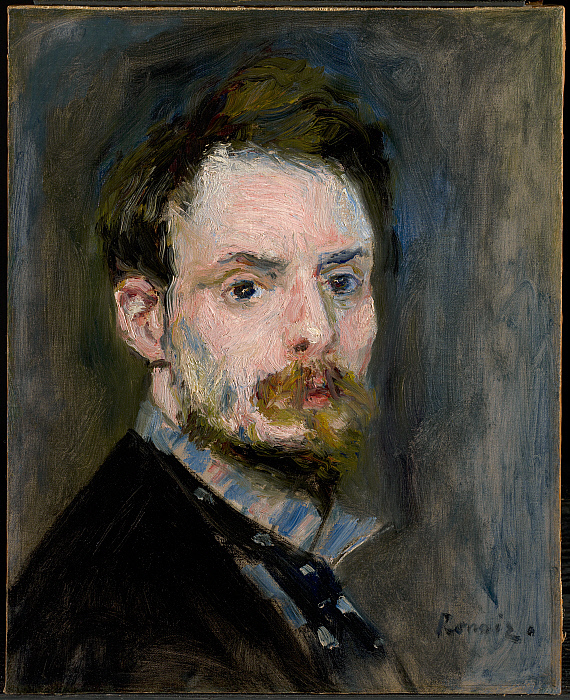 PIERRE‐AUGUSTE RENOIR (1841–1919) Self‐Portrait (Autoportrait) c. 1875 Oil on canvas Sterling and Francine Clark Art Institute, Williamstown, Massachusetts In a rare self‐portrait, Renoir captures the ambitious young ma n that he was in his mid‐thirties, struggling to make a living as a painter. Just a few years late r, as he approached his fortieth birthday, he determined not to put off any longer the challenge of a complex group composition to be painted on the terrace of the Maison Fournaise. PIERRE‐AUGUSTE RENOIR (1841–1919) Man with a Little Hat (L’Homme au petit chapeau) 1877 Oil on canvas Private collection Renoir made two small portraits of his friend Baron Raoul Barbi er in 1877 and 1878. Barbier frequented the Maison Fournaise and was desc ribed by Georges Rivière as a man of inexhaustible energy and goodwill. Barbier modeled for Luncheon of the Boating Party —although Renoir depicts Barbier from the back, he is easily identifiable as he is wearing the same bowle r style hat as in this portrait. MARCELLIN DESBOUTIN (1823–1902) Portrait of Renoir (Portrait de Renoir) 1877 Drypoint Institut national d’histoire de l’art, Paris Marcellin Desboutin, who showed his work in the third Impressionist exhibition of 1876 and also exhibited at the Salon, made paintings and etchings in a relatively conservative style. Joining the Impressionist group at the Café Nouvelle‐Athènes during the 1870s, he shared their radical views about art and society. In this portrait of Renoir, Desboutin captured his friend’s relaxed intensity as well as his characteristic informality of dress and posture. 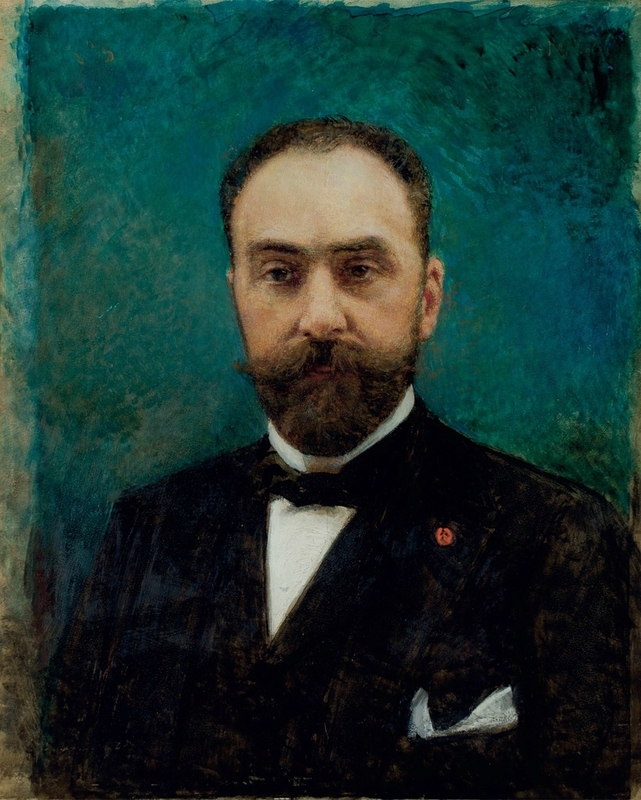 Renoir’s friend Georges Rivière reviewed the second Impressionist exhibition for the journal L’Esprit moderne and the following year he wrote about the “new painting” of the Impressionists for a short‐lived weekly, L’Impressioniste, where he again praised Renoir’s work with lavish enthusiasm. He became a close friend of Renoir, often accompanying him to evening soirées at the home of Marguerite and Georges Charpentier, publishers of La Vie moderne . Fifteen years younger than the artist, Rivière modeled for Dance at the Moulin de la Galette (1876). This profile portrait of Rivière with his strong brows and pencil‐thin moustache may underlie the face in profile at the center of Luncheon of the Boating Party. Founder Duncan Phillips first encountered Pierre-Auguste Renoir’s Luncheon of the Boating Party in 1911 while he was in Europe and the painting was owned by the artist’s dealer Paul Durand-Ruel. A few years later in a 1914 essay, Phillips was still taken by the masterpiece and wrote that it captured the essence of “life’s vivacity” and the pleasures of “men and women lunching up the river on a hot holiday, the fitful breeze flapping the awnings and the general discussion becoming of more importance than the dessert.” While preparing to establish a museum of modern art and its sources, Phillips started an acquisition strategy that identified significant masterworks to serve as the collection’s foundation. 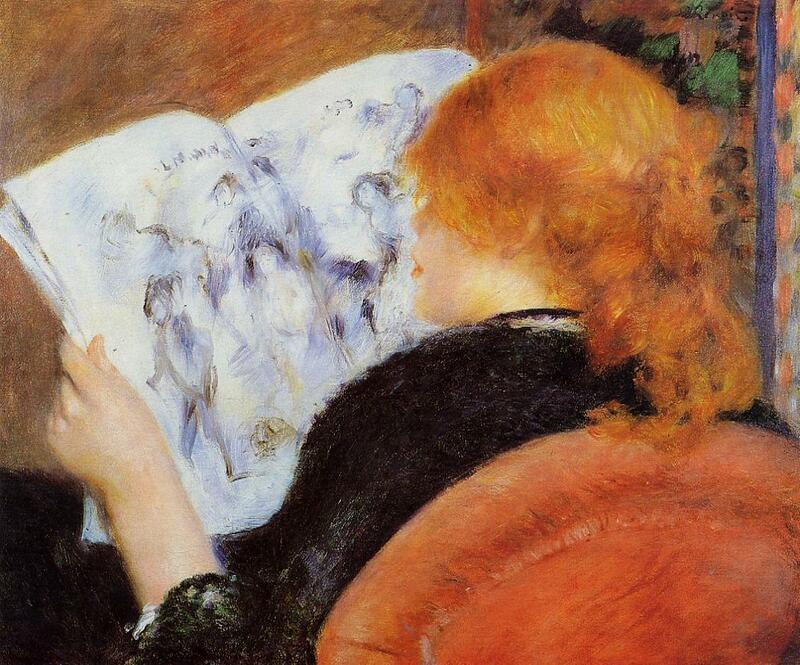 Duncan Phillips’s journals reveal that Renoir’s painting was at the top of his wish list. Just as Phillips imagined it would be when he bought the painting in 1923, Luncheon of the Boating Party by Renoir remains the best known and most popular work of art at The Phillips Collection. 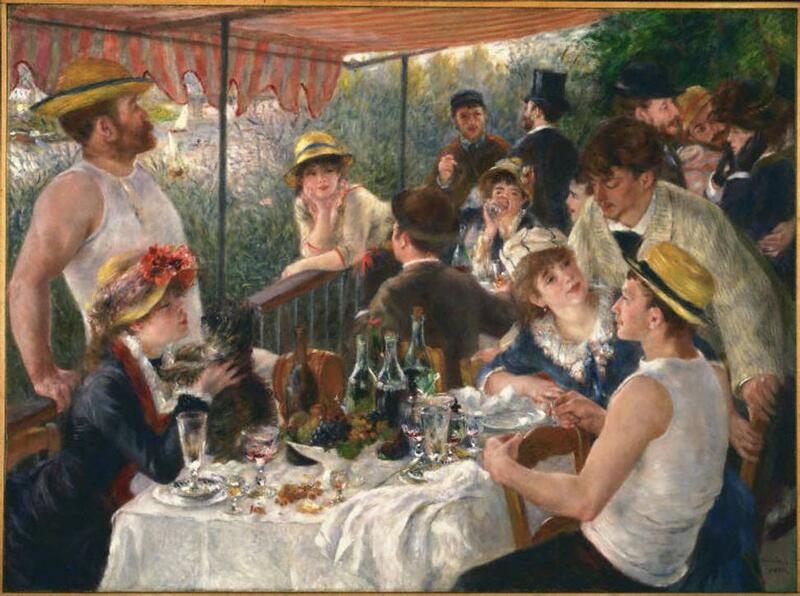 The painting captures an idyllic atmosphere as Renoir's friends share food, wine, and conversation on a balcony overlooking the Seine at the Maison Fournaise restaurant in Chatou. Parisians flocked to the Maison Fournaise to rent rowing skiffs, eat a good meal, or stay the night. The painting also reflects the changing character of French society in the mid- to late 19th century. The restaurant welcomed customers of many classes, including businessmen, society women, artists, actresses, writers, critics, seamstresses, and shop girls. This diverse group embodied a new, modern Parisian society. Renoir and Friends: Luncheon of the Boating Party will be accompanied by a full-color catalogue published by D Giles Limited. The publication, edited by Eliza Rathbone (Chief Curator Emerita, The Phillips Collection), will feature Rathbone’s essay along with others by Elizabeth Steele (Head of Conservation, The Phillips Collection), Sara Tas (Curator of Exhibitions, Jewish Historical Museum, Amsterdam), Mary Morton (Curator and Head of the Department of French Painting, National Gallery of Art), Aileen Riberio (Professor Emerita, Courtauld Institute of Art, United Kingdom), and Sylvie Patry (Deputy Director for Collections and Exhibitions and Chief Curator, Barnes Foundation, Philadelphia).